Our Mission: Concepte of Illinois is dedicated in providing great service and support. Products that are high quality and service with the most absolute integrity that our customers deserve and expect. Our Belief: Integrity with Dignity consists not in the possession honors, but in knowing you have earned them. What We Do: Concepte of Illinois is a Consulting Business Service Company that provides for the needs of government and commercial business alike. We do this though consulting, designing & layout, sales, service, installation and support of computer network systems ensuring that data security and safety is always a top priority. We also provide custom programming and internet management for your needs in the Internet cloud. all of your business technology needs. Each and every client should expect nothing short of excellence in every dealing with our company. Each and every client’s request or concern deserves the full attention and resources of our company. Each and every system should be designed and implemented with a specific performance or productivity enhancement as the final result. Concepte of Illinois is devoted to being at its best. If something is important to our client, it is important to us. Concepte has a shout out – April 2014 Business of the Month. 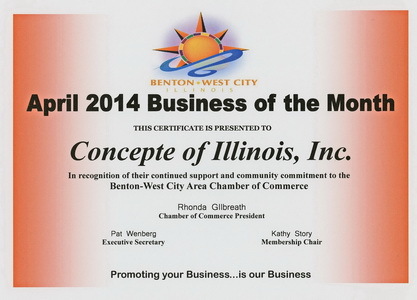 This is the second time we have been honored with the Business of the Month award by the Benton-West City Chamber of Commerce. The Benton/West City Chamber gave us top honors also when they recognized us for Business of the Year. Everyone at Concepte wishes to thank the chamber for their recognition and we will always strive to excel as a business partner.